Yes, when my one picky eater announces a full fledged declaration of endorsement, it’s got to be good. Yet what I love more than how amazing these Parmesan Ranch Chicken Tenders are in the eyes of our kids, is the fact that this recipe meets my 10 Minute Dinner criteria. Not only do they whip up in minutes, but they are moist, delicious and divinely low fat, which is why I always double or triple the recipe. Then I have extra tenders on hand for sandwiches, salads, chicken tortillas etc. When I have healthy snacks on hand for our family, we are much more likely to grab better food choices, rather than the chips. Ever since the kids were little, they’d eat tons of raw veggies if I served them with ranch dip. Every food group is better with ranch, in my opinion, but that’s my french fry tangent attempting to slip through. 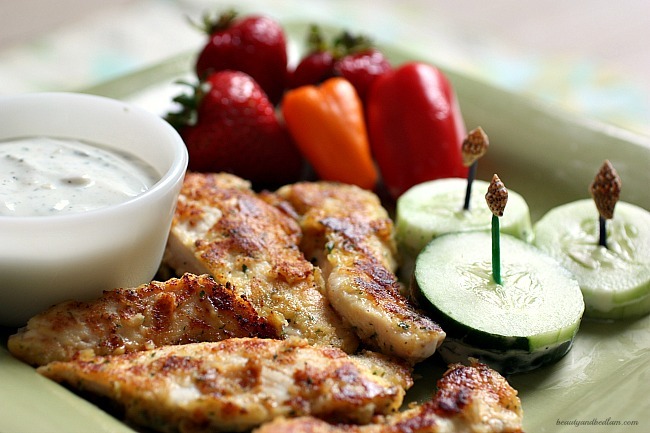 For years, I’ve used Hidden Valley® Ranch dip mix. Their blend of herbs and spices takes an ordinary recipe to something special, so when they recently came out with two new products, Hidden Valley® Greek Yogurt Dips and Salad Dressing Mix, with less fat, more protein and fewer calories when mixed with nonfat Greek yogurt, I was thrilled. 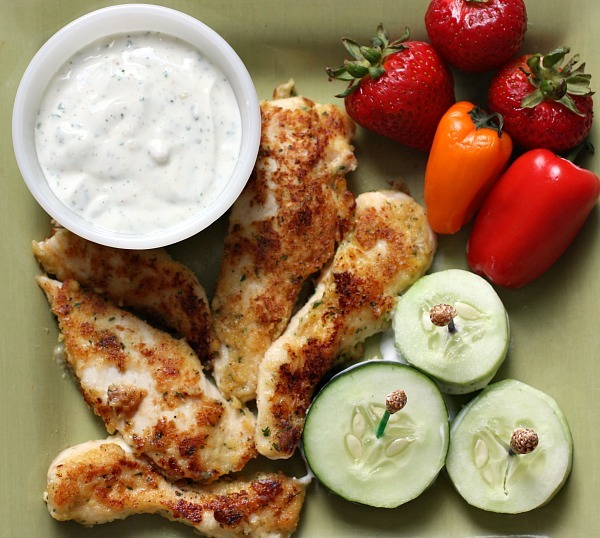 I used the Greek Yogurt dry dip mix with Parmesan cheese as the coating to create these Parmesan Ranch chicken tenders and it’s now a new favorite. Then I also mixed greek yogurt and the dip mix as a great filling for little cucumber sandwiches, another hit. You can easily use any dry Ranch mix (I keep them on hand for zesting up recipes), but I was going for something new. Our 12 year old was my main helper with this dinner and she is thrilled because she can make these tenders all by herself. Yes, cooking with kids always makes great memories. 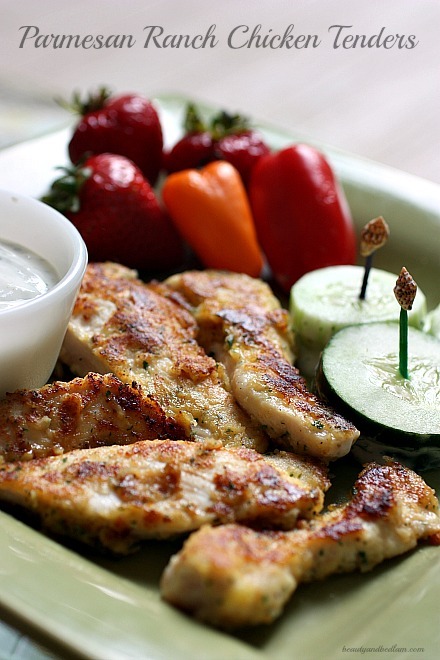 Enjoy this easy and delicious amazing recipe. I hope you enjoy it as much as we do and that a little miracle happens at your table. Summary: Not only is this Parmesan Ranch Chicken Tender recipe easy and delicious, but low fat, making it all around amazing. In a bowl or plate, combine the dry mix with the cheese. In another shallow bowl, beat the eggs. Dip the chicken in the eggs and then dip in the cheese mixture, coating well on both sides. Melt the butter in skillet over medium heat. Saute for 4 – 5 minutes on each side or until cooked thoroughly (no pink inside). Do you love Ranch dip as much as I do? What is your favorite way to get your kids to eat their veggies? Hi. I bought all the ingredients to make this but upon reading the directions Im a tad confused. Would you clarify something for me please. The directions read to combine the dry mix with the cheese. EZ. But the final step reads to serve with ranch. So my question is how can I use the same package of ranch in step 2 and then again in step 7???? Thanks so much for the clarification! huggs.